Release 4.2 offers additional capabilities to help your agents to actively increase conversion rate by focusing their attention on prospects most likely to convert. 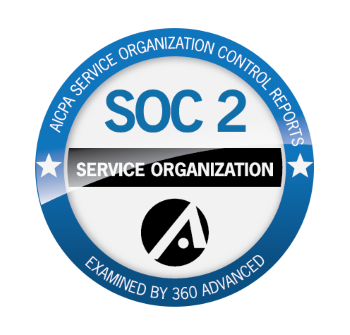 Additional improvements include improved usability via the inclusion of additional audible alerts, and a number bug fixes. 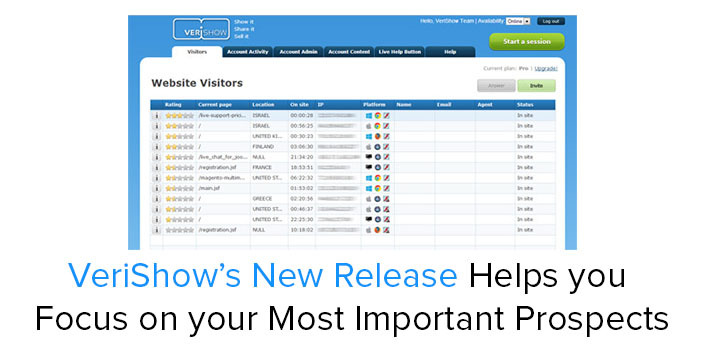 VeriShow now includes the ability to monitor visitors on your website in real-time. Each website page that is tagged with VeriShow code or has the embedded VeriShow live help button will show the visitors in the newly designed ‘Website Visitors’ page (previously known as ‘Incoming Sessions’ page). The agent can see, in real time, various parameters of information about each visitor to the site (e.g. location, current page being visited). In addition, there is also a new star-based rating system to rate each visitor from the moment they arrive. That rating indicates a conversion potential calculated by VeriShow’s special algorithm. Agents can see at a glance the visitor’s potential for conversion and be more informed with regard to when to engage a customer. It is also possible to view additional information about the visitor by clicking on an (i) icon next to each visitor. The visitor list is sorted in an effective way where the most important (highly-rated) visitors appear at the top of the list, saving agents the time to look for them for themselves. The visitor rating system assists agents with deciding who to engage when using VeriShow’s improved proactive invite functionality. Agents can select a particular visitor and invite them to a session, which can include live chat, audio and video, content sharing and co-browsing. The already existing automatic time-based invite of visitors to chat can still be enabled instead of the manual invite. Audible Feedback added – such as when stopping audio or video interaction or when ending a session. 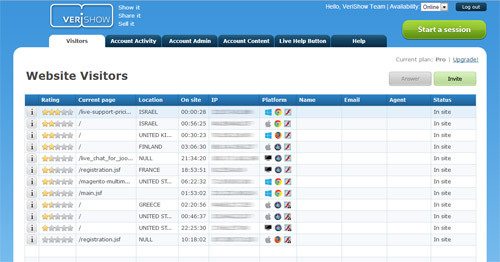 If you already have a VeriShow account, log into your account and see the new features in action. If you do not have an account, try it for free. If you have any questions, please do not hesitate to contact us.